After heavy losses yesterday following the IEA’s bearish report, oil markets are continuing their turn downward. Crude prices yesterday gave up just over $1/bbl yesterday, sinking back down to the $55 range. Prices are continuing their losses this morning, down 60 cents (1.1%) to $55.10. Refined products also fell yesterday, with gasoline leading the complex lower. Gasoline has posted losses for the past five sessions, and total losses are nearing 10 cents. Yesterday, prices fell 3.2 cents from the previous day’s close after API data showed a build, and today prices are down another 2.4 cents (1.4%). Gasoline prices are currently trading at $1.7370, roughly 9 cents below their peak last Wednesday. Diesel has performed slightly better, with only four straight trading sessions of losses, for a total of roughly five cents lost. Yesterday prices gave up 2.7 cents, and today prices are continuing their decline by giving up 1.4 cents (0.8%). Diesel prices are currently trading at $1.8926. 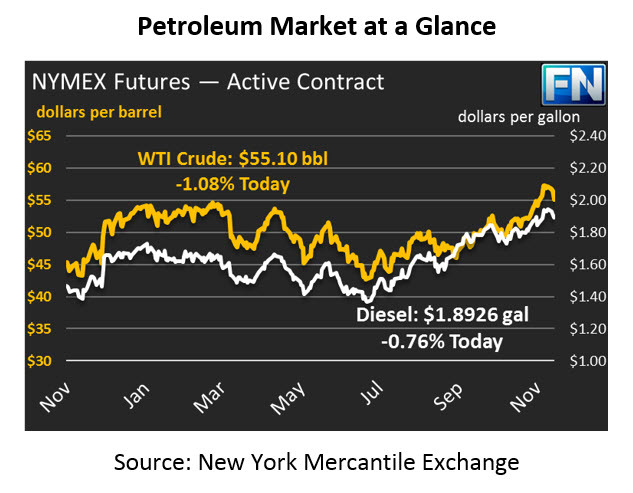 After a bearish IEA report that showed a slightly oversupplied market in 2018, prices lost strength following an API with surprise stock builds for both crude oil and gasoline. Diesel demand and exports were strong enough to continue the diesel draws, though demand has been weakened in recent weeks as the harvest season and busy construction season draws to a close. Markets are anxiously awaiting the EIA’s inventory report; a confirmation of the steep crude and gasoline builds could send the market even lower, while a conflicting report would help support prices.